Gunung Geulis Country Club is located in the Bogor area 45 minutes off Jagorawi Highway and about 50 kilometers center of Jakarta. Sprawled over 450 hectares the 36-hole golf resort is in the hills 450 meters above sea level. Fresh air and excellent views are ever present. Gunung Geulis, which means beautiful mountain in the Indonesian, is bounded rivers and mountains. There are 36 holes on offer, with the original West Course opened in 1992, and the newer East Course which opened in 1994. Thomson, Wolveridge, and Perret, world famous Australian golf course architects, designed both courses. Measuring 6,075 meters, the West Course requires proper course management and club selection to score well. Hole 1 is short par-4. The surrounding countryside is in full view, and there is a 30-meter elevation drop to the fairway off the first tee. A cautious driver or 3-wood is highly recommended to start the course off with an easy par. Every hole at Gunung Geulis is unique, and most have excellent views to boot. The course appeals to low markers as each poses a challenge. Doglegs, sand traps, water, trees, or waste areas come into play all through the course. Many of the holes would not look out of place elsewhere, especially the uniquely crafted pot bunkers that dot the routing. 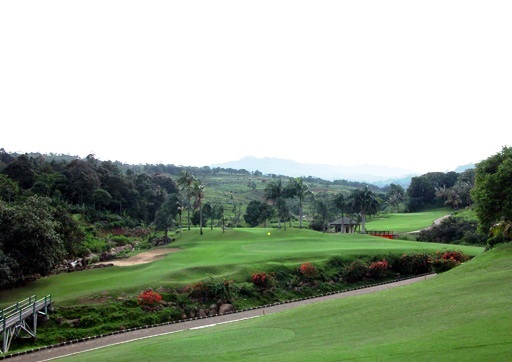 The Gunung Geulis East Course plays to 6,065 meters and is too hilly to walk. The front 9 or Valley Course is undulating, following the contour of the hills. The back 9 Hill Course is gentler with wider fairways. The course has a distinctive British links style. Fairways are up and down, with a lot of movement and carefully placed bunkers. Although the East Course is shorter than the West, the tighter, sloping fairways, and hazards offer a more challenging round of golf. Breathtaking natural and wild landscapes set amid the misty slopes of the Bogor Mountains reward all golfers. Hole 8 is one of the standouts. Although the par-5 plays a short 433 meters from the blue tees, the narrow fairway with a huge lake on the left side makes golfers think twice about using the driver. However, a good drive will allow long hitters to go for it in two. Taking on the green requires excellent accuracy as well since it is a blind downhill shot with several pot bunkers around the putting surface. Hole 9 is also unique. The par-3 requires a long iron to hybrid to a tiny green some 50 meters below the tee. Throughout the valley’s front nine, the course offers open panoramic views of the mountains. The back nine plays up and down on steeper hilly terrain. The fairways are more forgiving in width, but more undulated. The par-3 sixteenth is a keeper and plays much longer than the 164 meters on the card due to the steep incline. The entrance to the elevated green is very tight, and bunkers on either side catch anything short, left, or right. Gunung Geulis is an excellent choice for those headed to Bogor and wanting to escape from the hectic city rush in Jakarta. Both courses are worth playing. The iconic Gunung Geulis clubhouse is massive in scale and a welcoming site, unique in design, with its circular blue roof, designed by the famous Australian architect Kym Hughes. Full facilities include part of a comprehensive golf resort. However, the resort standard is not high and more for locals spending a day or two outside of Jakarta. Nevertheless, Gunung Geulis is a good choice for those headed to Bogor and wanting to escape from the hectic city rush in Jakarta. Both courses are worth playing. Have you played golf at the Gunung Geulis Country Club and took some nice photos that you would like to share with other golfers? Send them to us and we may upload them here. Thank you in advance!